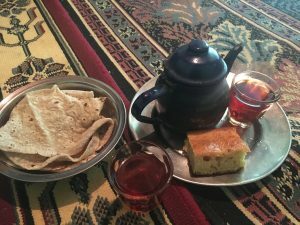 Late on a Friday morning, as I strolled amongst the goats and chickens running about on a sandy back road in the Asalah district of Dahab, Egypt, a Bedouin woman, covered in a swirl of a colorful clothing and a headscarf, invited me into her home for tea. This is normal for Asalah. Usually it’s the children who invite me for tea. One time it was a man, who became my friend. 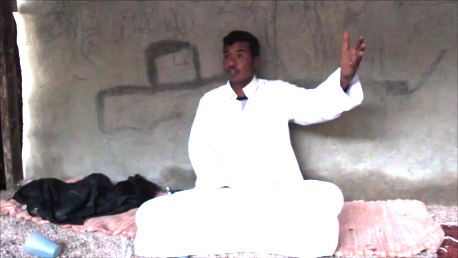 Now was the first time a Bedouin woman had invited me. Bedouins are known for hospitality. Originally from Saudi Arabia and traditionally nomadic, there are perhaps dozens of Bedouin tribes throughout the Middle East, several of which live in the South Sinai where the little town of Dahab is. 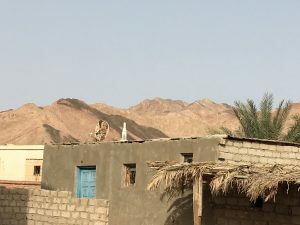 The Bedouins in Dahab are settled now and live in permanent homes, which usually have sort of tented areas made of cloth or dried palms fronds either attached to the entrance or standing separately in front of their homes. When they invite me in for tea, it’s in their tent that we usually sit. However, this day we went straight into the woman’s house, where I sat with her toddler son and infant daughter, who was sick from teething. Bedouin living room furniture consists of floor cushions, and on them I sat as the woman placed tea, a small cake and a bowl of Bedouin bread on the floor in front of me. I had barely had time to touch it when she motioned for me to come along with her. 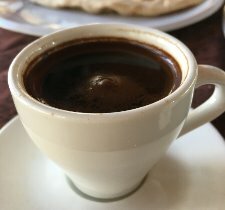 Although I know very little Arabic and she spoke very little English, it seemed that we were going to her sister’s home, also for tea. Through a doorway concealed by a wool blanket we stepped into an area where eight young women were seated on the sandy ground, some with scarves of red or green or black, some with scarves of many colors, wrapped around their heads and faces. 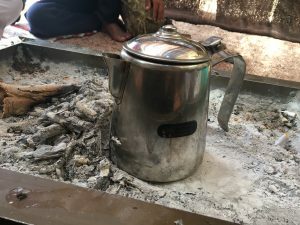 They sat around a rectangular metal stand with a small fire going on the top, on which Bedouin women and men make kettles of coffee and tea for themselves, their families, relatives, friends and neighbors all day long. They were all silent when they saw me and smiled when the woman introduced me. I asked them one at a time what their names were, and I also learned that almost all of them were 17 years old. Two of them, cousins, spoke good English. It was shortly before noon, and they would leave soon for the noontime prayer. 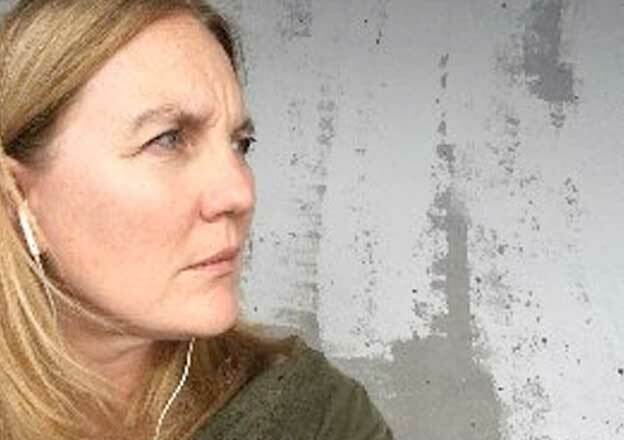 I assumed they would go to one of the neighborhood mosques, but the woman who had originally invited me said it isn’t possible for them to worship at a mosque because it’s forbidden for men to see women pray. So they pray at home. But isn’t there a separate women’s prayer room? I asked. No. Mosques don’t have women’s prayer rooms anymore, they tell me. Years ago, but not now. There are no more prayer rooms for women in mosques. I said But there are prayer rooms for women. I’ve gone inside them in other mosques in the Middle East. I’ve seen them. Those who spoke English translated for the others. Their eyes widened and their faces became puzzled. They didn’t know. The muezzin began the call to prayer, and most everyone immediately stood up and slipped through the blanketed doorway. I was left with the woman who had invited me as well as the two English speaking girls. We could go have more tea and coffee at their home if I wanted to, they said, and of course I accepted. They walked in front of me silently on hidden back roads lined with tightly packed one-story concrete homes, the narrow sandy paths filled with small rocks which became uncomfortably stuck in my sandals. The entrance to the sitting area outside their house was covered by a faded blue rug with a large pattern of some type of flower. 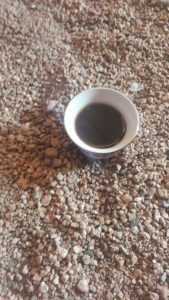 One of the young women pulled it aside and we stepped up onto tiny rocks with a few traditional Bedouin multicolored rugs on the ground, a tea and coffee stand in the middle of the floor. The walls were knee-high and concrete and the ceiling was made of thin strips of wood. Interwoven dried palm fronds reached from the concrete to the wood, preventing the sun from getting in and lending a little privacy. 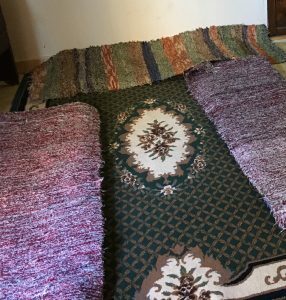 The oldest cousin went into the house to wash before praying, came out with a red prayer rug, set it on the ground and faced what I think was east (Muslims face toward the holy city of Mekkah in Saudi Arabia when they pray, and this is east of Egypt and most of the Middle East). While she prayed, her cousin and I sat on the ground, smiling at each other. Then it was her turn to pray. After she was finished she folded up the red rug and laid it carefully over the low wall. Then she began to place sticks on the metal stand to build a fire and tore off strips of the dried palm frond wall for kindling. She blew on the fire to get it going so I did too, but she wasn’t satisfied and told me to blow harder to make the fire hotter. Cats slipped in and out of where we sat, and when visitors pulled the blanket aside to come in I could see goats gathered. Bedouins must be very social people I realized, as there are usually many gathered together inside the homes where I’ve been invited, and now women and children were coming and going as we sat and talked, sipping tiny ceramic cups of coffee and tiny glasses of tea. I’m not used to sitting on the ground cross legged for hours as Bedouins do, and it’s uncomfortable, so I stretch out my legs. I like your feet the younger cousin said. She was referring, I am sure, to the green nail polish on my toes. I like your brain, the older cousin told me. She said this I think because, not knowing their culture, I am careful and ask permission before doing something if I think they might not like it. I stayed for so long it was time for them to pray again, so I said I would leave. I like them, they seem to like me, and we live in the same neighborhood. I will be back.